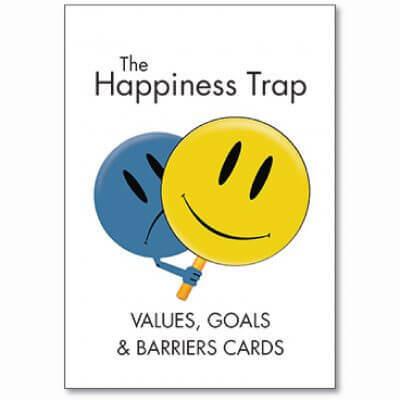 A unique set of ‘Values, Goals and Barriers cards’, designed by Russ Harris, with illustrations by Bev Aisbett. These cards will enable you to not only clarify values, but also to set goals, create action plans, identify barriers and obstacles, defuse from unhelpful stories, develop willingness for unpleasant emotions, and much more. There are 52 cards in total. 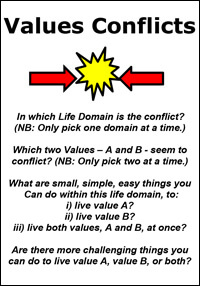 There are forty values cards which each a) list a common value, b) include a humorous full-colour illustration to help explain it, and c) just for good measure, include a sentence or two explaining what the value means. And there are twelve additional cards for purposes such as goal setting, identifying emotional barriers, dealing with values-conflicts etc. 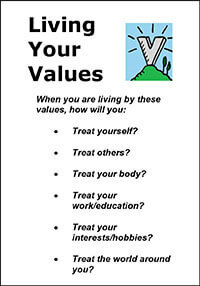 To download a set of instructions for use with the Values Cards, click here.